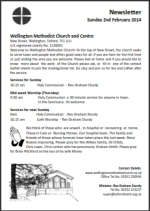 We are a very open, welcoming Christian Community based in the market town of Wellington, Telford, Shropshire. Our growing church includes people of all ages and of many nationalities. We have an exciting and growing work with children and young people with fantastic Sunday groups for all ages. Our annual International Lunch is a real treat for all involved! Those who come for the first time to either our Sunday Worship or to one of our many mid-week groups, receive a friendly warm welcome and soon feel a real sense of belonging to our community. Why not drop in to meet us and have a chat? All the details of our weekly programme are here on our website.